The 1949 Manchester DC-3 accident occurred when a twin-engined British European Airways Douglas DC-3 (registration: G-AHCY) crashed at Oldham, near Manchester, after a flight from Belfast. 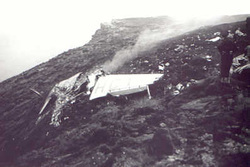 The accident killed 24 of the passengers and crew on board. The aircraft had first flown in 1944, and was captained by F. W. Pinkerton, a former RAF serviceman who, as a sergeant, had been posted missing during World War 2. The airline was government-owned. The aircraft took off from Belfast Nutts Corner Airport at 10:58 on a short-haul flight to Manchester Airport, with twenty-nine passengers and either three or four crew members on board. US newspaper reports, using agency reports filed soon after the incident, favour the former number of crew; Flight Magazine, reporting a little time later, favoured the latter. An hour after take-off, at 11:59, the last radio contact with the crew occurred and about one minute later the aircraft crashed. It was flying at approximately 1,350 feet (410 m) when it hit a mist-covered hill (53°31.240′N 1°58.733′W) at Wimberry Stones, near to the Chew Valley at Saddleworth, Oldham, 15 miles (24 km) from Manchester Airport. Contact was made approximately 20 feet (6.1 m) from the summit. The aircraft broke up and caught fire. Twenty-one passengers and all the crew members died, leaving eight survivors. The cause of the accident was an error in navigation, incorrect approach procedure and failure to check the position of the aircraft accurately before the descent from a safe height. This is a photograph of the crash site at Wimberry Stones. Ironically, the crash occurred in the same peaks that George had chosen for his new home and only a short distance from it. George was fifty-six when he died. As far as we know, his only child, Vera, went on to marry Otto Togel in Chapel-en-le-Frith in 1951 and in that same year had a son who was registered as Joseph P. Gisby and Joseph P. Togel.